This is a completely customized sand volleyball theme wedding cake topper ordered by one of our customers. They would like the bride and groom to be in their dress and tux with bride's figurine setting groom the ball since these are their actual positions. The ball is in bride's hands in the setting position, and the groom is in the air jumping ready to hit her set. A volleyball net is placed behind them. 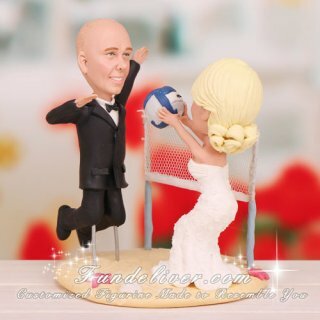 Want to know why they order this sand volleyball wedding cake topper? Thank Joe and Megan for sharing their idea and story. My fiancée and I met on the beach playing sand volleyball 3 years ago. Over the next 2 years we played against each other in volleyball leagues until we started dating. We then started playing together on the same team. I have been the middle hitter and she has been my setter since we started dating. Last November, I proposed to her on the beach at sunset. We feel that since volleyball is the reason we met, kept running into each other, and started dating that it is only fitting that it be the focal point of our cake on our wedding day. Our entire wedding from the invitations to the cake is all beach-themed with volleyball being incorporated as much as possible. Our centerpieces are even glass cylinders filled with shells collected from beside the beach volleyball court where we first met. Love their idea and story? Why not get your favorite sports involved in your wedding to reflect your personalities and interests?